Like to feel elegant? Like fun fair photos? 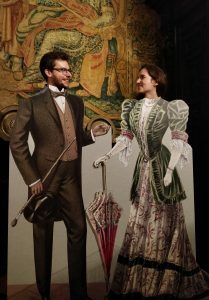 Come to the Bagatti Valsecchi Museum on the 9th and 10th of February, and “wear” the height of late 19th century fashion. Thanks to Leica Camera Italia, you even get a printed photo souvenier of you and a friend. The event is part of the museum’s initiatives organized for the Sign here, please exhibit focussing on the stories of the people who signed the Bagatti Valsecchi guest books.